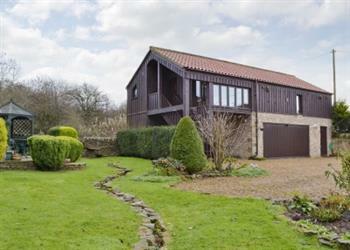 Oscars Barn in Piercebridge, near Darlington sleeps 4 people. 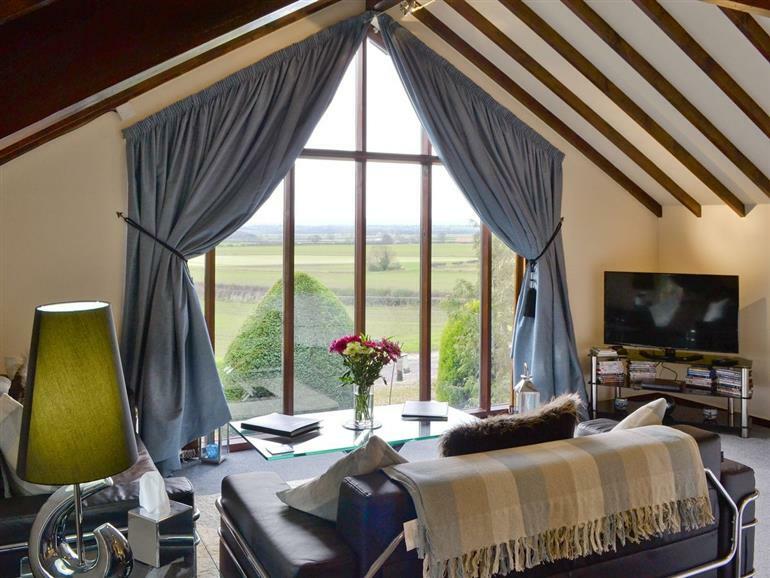 Oscars Barn near Darlington can be found on a hillside, surrounded by the beautiful countryside of Raby Estate’s land; guests will find that Oscar’s Barn offers far reaching views of the North York Moors to the east and the Pennines to the west. Perfect for walkers, cyclists and guests wanting to really explore the local area there are numerous established public footpaths through the surrounding woodland and countryside. Ideal for guests wanting to enjoy a quiet romantic break or for guests wanting to travel with friends or family, Oscar’s Barn can be booked as a separate property to sleep two people or along with a separate annex to sleep a total of four guests. Part of a larger property, which dates back to 1750, the accommodation has been furnished to a very good standard. Worthy of the VisitEngland 4* Gold Award, the property is well-presented throughout with excellent quality furnishings, contemporary features and appliances, as well as a travertine tiled floor in the kitchen - yet also manages to retain all of the original character and charm with exposed original beams and features. The separate annex can be accessed by crossing the small courtyard area and is also exceptionally well-furnished and offers guests a private bedroom and living area, its own fridge with freezer compartment, along with a superb bathroom. The sought after location offers guests peace and tranquillity and makes an ideal touring base with nearby mainline railway station and easy access to main roads. Oscar’s Barn is situated on the border between County Durham and Teesdale which grants any visitor easy access to a broad range of sights, attractions and activities. For that perfect romantic break with guests wanting to treat themselves, there is a Michelin starred restaurant just over a mile away in the small village of Summerhouse. Just 2½ miles away from the historic Roman village of Piercebridge, guests will be able to enjoy a visit to the ancient Roman fort, as well as stopping off at one of the local pubs and restaurants. The contemporary market town of Darlington is only 6½ miles away and offers plenty of shops and eateries. Raby Castle and Deer Park are 7 miles away and are not to be missed. Set in the heart of the Durham Dales, guests will be able to explore the castle and its beautiful 200 acre deer park. Barnard Castle and Richmond are both easily reached and lie 14 miles away, offering historic attractions including Bowes Museum, Barnard Castle and Richmond Castle, as well as local farmer’s markets, tea rooms, shops and boutiques. The historic cathedral city of Durham is only 16 miles away making Oscar’s Barn the perfect location for guests wanting to visit friends and family who are studying at the university or to book ahead for graduation ceremonies. A little further afield but still within an easy 1½-hour drive, guests will be able to visit the Yorkshire Dales, North York Moors, Durham Dales and Yorkshire Coast. The shop, pub and restaurant are all 2½ miles from Oscars Barn near Darlington. 12 open-tread steps to entrance. All on first floor: Living room with double bed (6ft zip and link, can be twin) and beams. Kitchen with breakfast area and tiled floor. Bathroom with shower over bath and toilet. Annex: Ground floor: Living room. 1 double bedroom (5ft zip and link, can be twin). First floor: Bathroom with Jacuzzi bath, shower cubicle and toilet. Gas central heating, gas, electricity, bed linen and towels included. 32’’ Freeview TV. DVD. CD. iPod dock. Gas hob. Electric oven. Microwave. Washing machine. Freezer. Wi-Fi. Lawned garden with patio, terrace, sitting-out area and furniture. Summerhouse. Gas barbecue. Parking (2 cars). Hot tub on request (at cost). Welcome pack. No smoking. No children under 12 years. NB: Deep pond in grounds 100 yards. Holidays at Oscars Barn run from Friday to Friday. Pets allowed at Oscars Barn. For a better idea of where Oscars Barn is, you can see Oscars Barn on the map below. Oscars Barn is in Durham; should you be on the lookout for a special offer, you can find all the special offers in Durham. It's always worth checking to see what is on offer at the moment. Do you want to holiday near Oscars Barn (W44108), you can see other cottages within 25 miles of Oscars Barn; have a look to find your perfect holiday location.